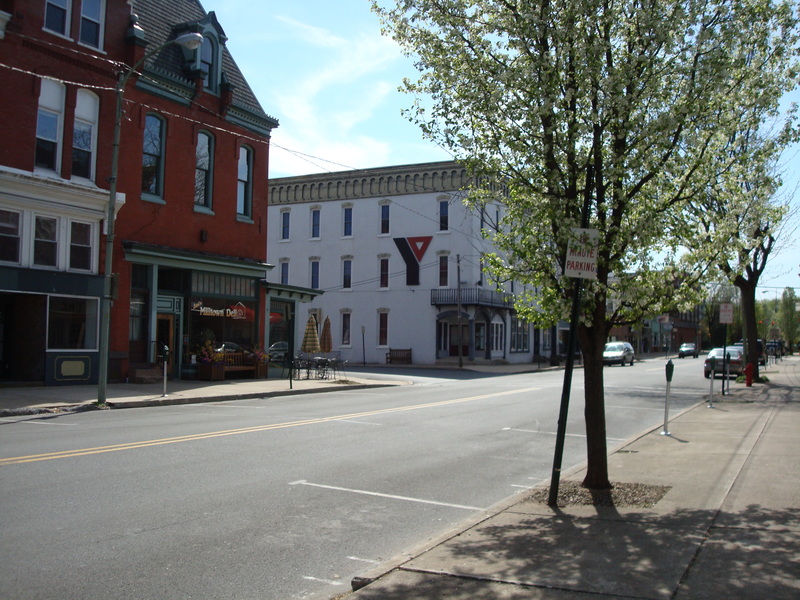 Saturday, March 23, 1912:Ruth and I went to Milton this morning on a shopping tour. I needed a pair of new shoes and so I got them. We went in and came out on the train so you can see we weren’t gone long. Another view of downtown Milton. Milton was about five miles from the Muffly farm. There was a whistle-stop for the Susquehanna, Bloomsburg, and Berwick Railroad near their farm. Grandma and her sister Ruth probably needed to change trains at Watsontown. A hundred years ago Milton had a thriving downtown. Today better transportation, nearby malls, and several floods have all taken a toll–though hopefully the recent movement toward shopping local will help revive it. Posted on March 23, 2012 March 24, 2012 by SherylPosted in MiltonTagged 100 years ago, diary, family history, hundred years ago. Curiosity got the better of me, so I decided to look up the addresses on Google Maps. The building in the picture looks like it stretches back quite a way. I also noticed two addresses; one at 59-61 South Front Street, and the other at 70 Elm Street, and both were in Milton. Front and Elm run parallel to one another and there are no streets between them. I think that the two addresses are related to one building that ran the length of the block. It probably had entrances on both Front Street and on Elm Street (does it look like a hint of a door at the end of all those rows and rows of shoes?). In a city directory, I found that 59 South Front Street now houses a Century 21. It is next to a jewelry, card, and gift shop named Fedder’s that is on the corner of South Front Street and South Center Street (don’t ask me how two streets can both go south and intersect). While the walls are painted white now and the building is showing signs of age, the image from Google Maps still shows the glass display area shown in the advertisement. I wonder if the sidewalk still shows any traces of the old store name. There are some quite nice older buildings in that area. It would be nice if some of them would get a face lift. Imagining a pleasant Saturday taking the train to town to do nothing but buy a pair of shoes. Shopping seems like it was so much simpler then – your grandma didn’t complain about being tired afterwards. Shopping often leaves me overwhelmed with so many choices to consider. I wonder how many pairs of shoes a typical person owned a hundred years ago…. It does seem simpler back then, though she must have had several pairs of shoes. This is the third time in the diary that she mentioned buying shoes (The other times were October 21, 1911 and June 22, 1911). After running parallel to South Front Street southward, Elm Street bends to the west and meets South Front Street. That corner is the best guess for the location of the shoe store, I think. PJ and Lars–Thanks for figuring out the location. Your comments motivated me to go through my photos. I don’t have any very good photos the location of the store, but I did add one that shows the row of stores that included Marsh Shoe Store. I’ll have to take some better photos next time in Milton! I think it’s interesting that the shoe storage and the area for trying on shoes are the same. Makes sense. 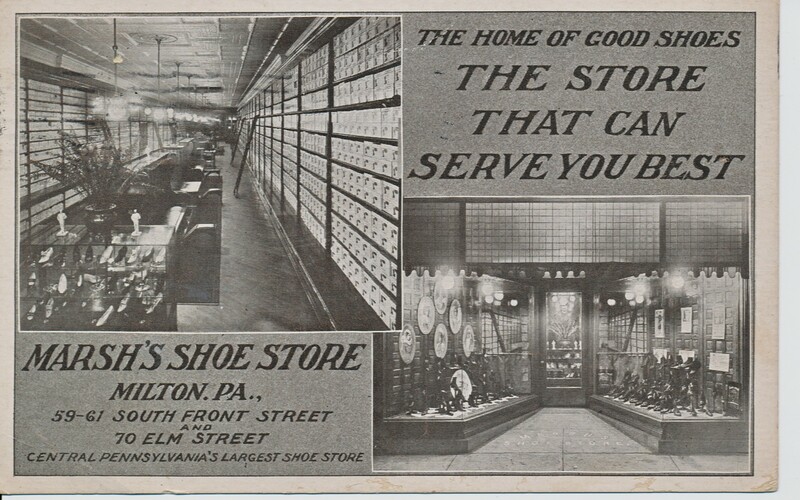 I can remember some shoe stores in central Pennsylvania that were organized like this when I was a child. In the 1970s when we came to Ashland, the local “mercantile” had shoes hung on nails for display. Worked well for shoes with shoestrings, not so well with others — some of these shoes were rather expensive and of good quality. As I remember the shoe department was in the basement — need the upstairs for important things like shovels, work clothes, etc. I miss the old-fashioned mercantile and department stores. There always was such a wonderful mix of items.